1. You are you, no matter where you are or who you happen to be with. It's true, I'm using two photos from the same day, but I'm OBSESSED with her outfit and I love what this photo communicates. I ask each client to identify three key words that she'd like people to use to describer her personal style. These are aspirational and we use them as filters when selecting her looks. For example: tailored, age appropriate and edgy. The word that adds the flavor is, "edgy." Of course, you're wiling to be edgier on a date or at a party; but that doesn't mean you need to sacrifice your edgy side when heading to the office. 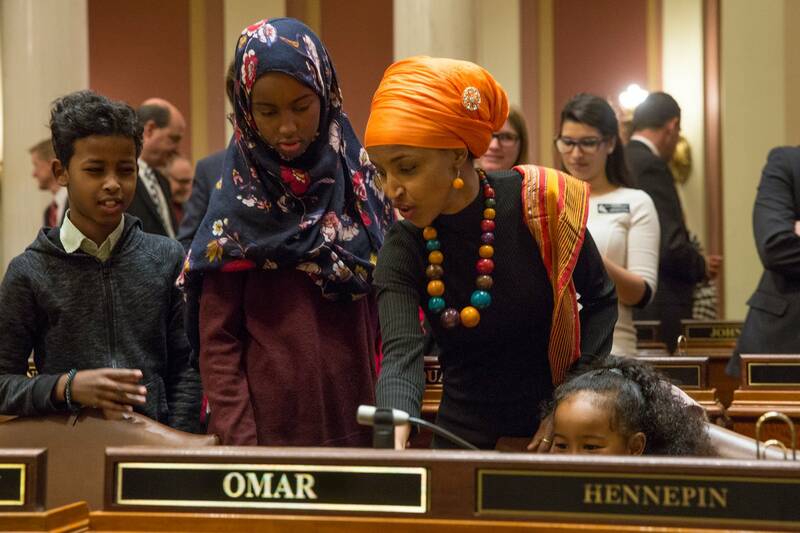 In this case, Representative Omar is confident, bold and put together. Her accessories communicate a lot about her: where she is from, what she values and that she is not afraid to look different from her peers. I would argue that these are all strengths, not weaknesses and should be celebrated. This outfit is equally appropriate for representing her district, spending time with her children or doing both (as she is in this photo). 2. Dressing casually does not mean sacrificing your personal style. Another common conundrum for clients who excel at dressing for work is finding a way to communicate personal style on the weekends and in casual environments. I often hear women who somehow think weekend wear isn't as important as their workweek ensembles. Not true. After all, you are really dressing for yourself more than anyone else. And, as it turns out, you are with you every single day. In this example, Representative Omar pairs a simple tee and black pants with her signature accessories, injecting memorable pieces to complete her look. The key here is signature accessories. Simply because something is bold and distinctive does not mean you must avoid wearing it regularly. In fact, the opposite is true. It's likely that Rep. Omar's look is one reason voters will remember meeting her and in politics as in life, that's a good thing. 3. Those "company" events with branded tees do not need to bring you down. Ah, Dear Reader, the number of questions I get about branded tees, jerseys for sports teams, and the like is unparalleled. These restrictions based on occasion rattle even the most fashion savvy woman. Again, Rep. Omar manages to shine despite the demands placed on her outfit selection. (Props to the fella with the shirt and tie, too). Rocking a maxi dress that is indicative of her signature style, she manages to find a way to look classy & elegant while coordinating with the branded tees all around. In this way, she makes the people around her feel at ease. Whether she is chatting with someone in a t-shirt and jeans or a suit and tie, they all feel comfortable in their own fashion choices which allows them to listen to her. Let's face it. No one likes to feel like the odd man or woman out. Knowing how to communicate who you are with integrity and class, in environments that can be intimidating is clearly one of Omar's long list of skills. My hope is that identifying powerful, fashionable women in your field and learning from them, will help you break new ground, too.